The Calder Memorial Trophy, named after former National Hockey League president Frank Calder, is awarded to the National Hockey League player judged to be the most proficient in his first season. Frank Calder was the NHL's president from 1917 until his sudden death in 1943. Although the NHL's best rookie was announced beginning with Carl Voss in 1933, it wasn't until the 1936-37 season and Syl Apps the recipient that the winner actually won the Calder Trophy. 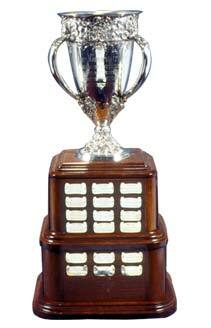 Upon Calder's death, the award became the Calder Memorial Trophy. Winner selected in a poll by the Professional Hockey Writers' Association at the end of the regular schedule.